ChipsAway International is delighted to be celebrating its 21st anniversary since being introduced to the UK back in 1994! Having grown and developed substantially since its initial launch, ChipsAway has always remained brand leader, standing head and shoulders above the competition and always striving for the best. Not only is this evident from its 300-strong network of fully-trained technicians, but also in the professional repairs they provide to customers nationwide! Specialising in minor automotive repairs, such as bumper scuffs, paintwork scratches and minor dents, ChipsAway technicians complete repairs in a matter of a few hours, at a location convenient to the customer, and all at a very reasonable price. The research also confirmed the company’s status as brand leader, with a staggering 10 times more brand recognition than their closest competitors, which is something they intend to not only uphold, but continue to grow. 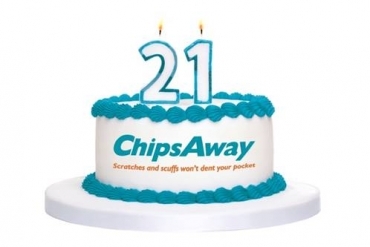 To this end, ChipsAway have big plans for further investment in technology and ongoing marketing activity, including another 7-month long TV advertising campaign, which commences this week! All figures, unless otherwise stated, are from YouGov Plc. Total sample size was 2,030 adults, of which 1,364 own a car. Fieldwork was undertaken between 5th – 7th September 2014. The survey was carried out online. The figures have been weighted and are representative of all GB adults (aged 18+).